Before the Declaration of Independence had been adopted, the revolutionary forces in the various thirteen colonies had used flags of whatever design appealed to the local troops. All that mattered was that the participants in a particular engagement could recognize the flags of their own units. Thus, from the start of the revolution in April of 1775 until the adoption of the Flag Resolution, there were dozens of flags identified as United States flags. The resolution of Congress limited the essentials of the flag’s design from June 14, 1777 until the present. Yet the resolution makes no specification as to how the stars are to be arranged nor whether red or white is to be the first color in the alternate stripes. As a result, variations persisted for the next century. The “Star Spangled Banner” flag which flew during the bombardment of Fort McHenry in Baltimore September 14, 1815 had fifteen stars and fifteen stripes to represent the enlarged United States. It was quickly realized that a growing Union would soon render the number of stripes unmanageable, so thereafter the stripes would remain at thirteen and only the number of stars would be increased to reflect the states. During the Civil War, many U.S. flag designs were present at every major battle. All featured thirteen stripes, but the constellation of stars was often a uniquely local pattern. In the latter days of that great conflict, many flags were made with golden stars rather than the specified white stars. This was due to the fact that many military flags used silver thread to embroider the stars on their regimental colors; it turned out that the silver thread quickly tarnished black in the sulphur-laden gunpowder smoke of the battlefield. It was not until 1912 that a full and formal specification of the U.S. flag — sizes, color shades, arrangement of the stars, and order of the stripes — was enacted by Congress. This was the familiar 48 star flag, until 2008 the longest lived of all the flag designs. The design of this flag was officially adopted on July 4, 1912, after the admission of Arizona, the last of the continental states, into the Union. This is the flag which flew over the American Expeditionary Forces in Europe 1917 – 1918, and over United States forces throughout the world from the attack on Pearl Harbor December 7, 1941 until the final surrender on September 2, 1945. 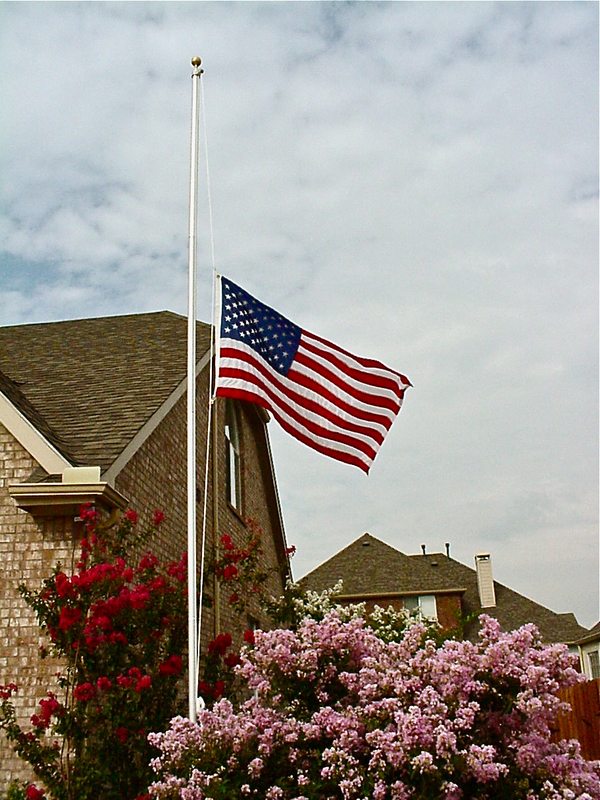 11 September 2001: When I arrived home that evening, my brother and I lowered my flag with proper ceremony, and then raised it again before taking it to half-mast. President Woodrow Wilson proclaimed the first nation-wide Flag Day in 1916, but there had been many observances by state and local entities for at least thirty years before. In 1949, Congress formally enacted the Federal Flag Day observance. Flag Day is a day not only for flying the flag, but to reflect on what it stands for and upon the history and the sacrifices it represents. There have been many hymns, patriotic songs, stories, and poems written about the flag of the United States of America, and a very famous pledge. Especially popular with grade school children is George M. Cohan’s spirited song You’re A Grand Old Flag. Francis Scott Key, inspired by the sight of the nation’s flag still flying above Baltimore’s Fort McHenry after a night of savage bombardment, started writing the poem which became The Star Spangled Banner while he was still aboard a British warship in Baltimore Harbor. Key’s poem was published in a Baltimore paper later that month. A music hall balladeer performed the poem as a song using the tune of a popular drinking song, To Anacreon in Heaven, and retitling it The Star Spangled Banner. This is the song that Congress officially declared the United States National Anthem in 1931. Among the scores of poems that have been inspired by the U.S. flag, my personal favorite is Barbara Frietchie by John Greenleaf Whittier. Written in 1863, when the outcome of the Civil War was far from certain, this poem celebrates the legendary courage of Barbara Frietchie, a resident of Frederick, Maryland, in the face of Rebel troops. In September of 1862, Confederate forces invaded Maryland. One column approached the fateful meeting at Antietam Creek by marching through Frederick. The battle of Antietam, the bloodiest day in U.S. history, resulted in a Confederate withdrawal. Barbara Frietchie is an idealized retelling of an idealized event; it is not at all what one might call truly historical. Whittier always stated that he wrote the poem in good faith based upon the best information he could obtain, but shortly after the poem was published, its accuracy was called into question. Apparently it is true that Old Barbara did wave her flag cheerfully as Union soldiers marched through Frederick after the battle of Antietam, and there were many Union Army veterans who in later years affirmed that they indeed recalled the ancient granny who cheered and waved her flag when they retook Frederick. While this was a fine and patriotic thing, no one clearly recalled “Dame Barbara” confronting Stonewall Jackson as the poem tells it. What seems to have happened is a conflation of two separate events: when Jackson’s troops marched through the town on that September morning, another woman of Frederick, Mrs. Mary Quantrell (or Quantrill) did indeed fly her U.S. flag while the Confederate troops passed by. Because Old Barbara was already well-known in Frederick, and because she had warmly cheered the Union troops who gratefully received her support after the battle, the deeds of Mary Quantrell quickly became associated with Barbara. And while Stonewall Jackson cannot be conclusively proven to have been in Frederick at all during the march, it was natural for the story to include the most famous of the Confederates in that vicinity. And so, as commonly happens, a couple of good stories — Mary Quantrell’s stubborn loyalty to the Union and Barbara Frietchie’s warm welcome of the Union troops — folded into one, and were further embellished to make a right wonderful tale. It was this rather embellished version that caught John Greenleaf Whittier’s attention in late 1863 as he was in Washington. Upon hearing the story from sources “respectable and trustworthy”, Whittier felt compelled to immortalize it in verse. He later acknowledged that his poem was possibly based upon “… a blending of the two incidents.” But he always asserted that it was valid nevertheless. I must agree with the poet. It is immaterial if the poem tells a precise, historical, and documented event; the poem does tell a truth that is greater and more enduring than any single genuine event. In Barbara Frietchie we see that courage is not limited by age nor by gender, and we see that people of honor will respect courage, even if they do not agree with the cause. Old Barbara Frietchie passed away in December of 1862 just days after reaching the age of 96. Stonewall Jackson died the following May after being wounded by his own troops at Chancellorsville. Jackson’s enduring fame was ensured well before the poem was published, but Barbara was truly immortalized by these 30 couplets. In 1866 a Nantucket schooner was christened Barbara Frietchie. Generations of Maryland school students were required to memorize the poem. My mom and dad told me about an unremarkable brand of candy that one could buy in Frederick in the 1930’s which was named after her. Today, unfortunately, such “sappy” and “saccharine” poetry is out of fashion, and even its praise for patriotism is considered rather antiquated. And so fewer and fewer people recall the poem, its fairly fictionalized heroine, or the simple concepts of loyalty to a cause, and bravery in the face of overwhelming force. Yet, as I observed above, if the events of the poem are not literally true, nevertheless the poem tells us truth. “Fire!” – out blazed the rifle-blast. This entry was posted in On This Day and tagged Barbara Frietchie, Flag Day, U.S. Flag, U.S. History by Jamie Rawson. Bookmark the permalink.